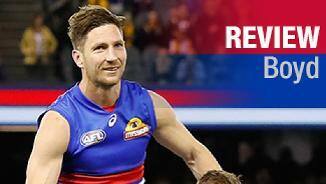 westernbulldogs.com.au reviews Matthew Boyd's 2017 season. Fletcher Roberts takes AFL Players inside the Footscray camp heading into finals. Matthew Boyd will break the record for the most games played by a rookie draftee against the Crows. 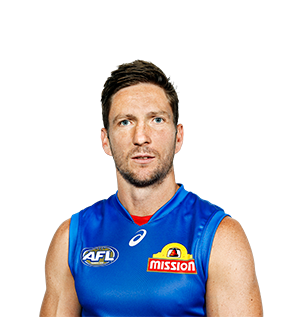 Forging a career as one of the league’s leading possessions winners, Matthew Boyd’s undying persistence has seen him rise from the Bulldogs rookie list in 2002 to become part of the competition’s elite. Hard working and reliable, Boyd was appointed captain of the Bulldogs ahead of the 2011 season. Boyd was named a member of the Club's history making 2016 AFL Premiership side, and was also named All Australian in the After being initially overlooked in the traditional draft, the Frankston recruit earned plaudits in the VFL which led to him being selected in the 2001 AFL Rookie Draft with the Bulldogs’ selection no. 23. While injury struck around him, Matthew Boyd was a constant, playing 24 games, including all four finals, his highest output since the 2009 season. But the battle-hardened warrior was more than just a presence down back, his 27.2 disposals at 79% efficiency was his highest total since 2013, and the 34-year-old was rewarded with his second career All-Australian selection. Boyd played a quarterback-like role off of half back at times this season, his 4.9 rebound 50s per contest ranking him number one at the Club and ninth in the League overall. A tireless contributor to the cause and never outworked, another relatively injury-free season will see Boyd enter the vaunted 300 Club. At 11,482 total metres gained, Boyd ranked second in the League overall behind Geelong’s Patrick Dangerfield. “I think the most pleasing aspect from an individual perspective it’s the most footy I’ve played since 2010. I played 24 games all up, missing one through suspension unfortunately for the first time in my career and another one through the management of an injury, so other than that it was a clean bill of health. Perhaps one of Luke Beveridge’s most notable coaching moves this season was sending Matthew Boyd to the backline. The veteran has made a career of being a prolific ball-winner in the middle of the ground, but with a host of young Bulldogs making their way through the midfield, Beveridge tasked Boyd with a half-back role. Boyd averaged 27 disposals and finished the year 17th in the league for that stat. He also ranked 12th for marks, 11th for rebound 50s and 16th for kicks. The 33-year-old picked up 24 disposals or more on 13 occasions, such was his ability to win the ball from the back half. He combined with Bob Murphy and Easton Wood to form a formidable trio in the Dogs’ defensive line, and was rewarded with an All-Australian nomination. With his proven ability to poll votes, and his eye-catching form this season, Boyd has been tipped by many to collect the most votes of any Bulldog in the Brownlow Medal. Boyd picked up a career-high 14 marks in his 250th game against Carlton in round 14. After being limited by injury in 2013, Matthew Boyd was back to his brilliant best in 2014. The durable midfielder took a step back from his typical inside role in 2014 to allow for the Bulldogs youth to step up, but his influence on the team was just as significant. At 32, Boyd provided maturity and stability in a young Bulldogs side, averaging 26.2 disposals and picked up the third most of any Dog, with 498. Boyd’s season included a massive 39 disposals against the Giants in round 4 but his most influential match came against Melbourne in round 15. Missing Ryan Griffen and Adam Cooney, Boyd took charge. He produced a game high 32 possessions, 20 of those contested, as well as nine clearances, eight tackles and one goal that helped lead the Bulldogs to a nail-biting victory at Etihad Stadium. 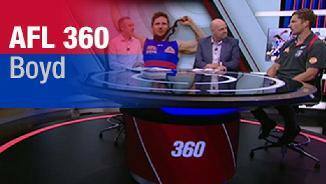 After 19 matches in 2014, Boyd requires only 11 more to reach his 250-game milestone. “Anyone that knows Matthew, understands just how professional he is, which we see as an important attribute, particularly for our young group to learn from. “His teammates and coaches value his contribution, especially in recent times where he has shouldered a lot of responsibility – and we look forward to seeing him continue his strong form next season.” – List Manager Jason McCartney, following Boyd’s contract extension to the end of 2015. 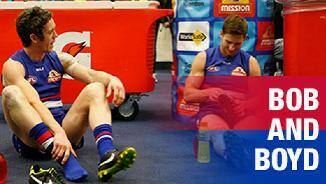 By Boyd’s lofty standards, season 2013 was one played in surges and cruelled by injury. While the skipper played just 13 games, he managed some impressive achievements and played an invaluable hand in several victories. He still averaged 29.4 disposals per game, the fifth most in the competition, and ranked 15th for both contested possession and clearance average. With 38 disposals, seven tackles and nine inside-50s and the three Brownlow votes against St Kilda in Round 9, Boyd inspired his team to snap a seven-game losing streak and press 7-7 win-loss record over the next 14 weeks. Despite playing just 13 games, the Bulldogs skipper still managed to rank fourth at the Club in total inside 50s (57), fourth in total clearances (71) and still topped the kennel in average disposals per game (29.4) - a statistical category he also ranked fifth overall in the AFL for in 2013. In Season 2012 Boyd continued to exceed even his own high standards on-field. Helping a young playing group transition to a more physically demanding playing style under Brendan McCartney, he has been a leader both on and off the field. The year has seen a number of personal achievements for Boyd, who played his second full season without missing a match and reached his 200 games milestone in round 16 against the Hawks. Vindicated his selection as captain with another stellar season. The Dogs’ chief ball-winner topped the AFL in disposals (701, averaging 31.86) and contested possessions (326, averaging 14.8) and was third in clearances (154, averaging seven a game) – earning him a second All-Australian selection and a second Charles Sutton Medal. Also the Dogs’ leading vote-getter in the Brownlow Medal with 24 (equal third).